The tech industry has been involved with the medical industry for years, however recently there have been a few big announcements that may highlight the future of tech disruption in medical breakthroughs. Google and Johnson & Johnson have announced they will work together to build a robotic surgery assistance platform. Apple is also recently in the news with the release of their research kit, which will basically turn the iPhone into a diagnostic tool with it's data collecting capabilities. Stanford and other universities are already planning to take advantage of the technology for studying the affects of chemotherapy and heart disease patients, and have developed apps to work with the kit. Collaboration between the pharmaceutical companies and the tech industry is important in my opinion as I feel it will be outside industries that will truly push medical breakthroughs and change peoples lives. One thing we do know is that it will take scientists, engineers, programmers, and innovators to keep these collaborations happening and progress moving forward. The United States has always been a global leader in this area, however many are worried we do not have the interest from students or teachers necessary to continue being a global leader and focus on STEM is needed. 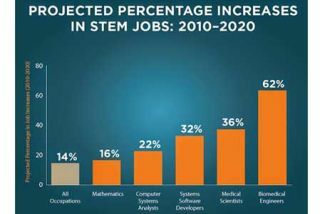 The US Department of Education has provided data to show the increase in STEM related jobs by 2020 and said that "Only 16 percent of American high school seniors are proficient in mathematics and interested in a STEM career." These numbers explain the push by the President and the Committee on STEM Education for creating the 5-Year Strategic Plan that guides efforts in improving STEM education. Along with the federal initiative there are many other organizations around the United States dedicated to bringing awareness to the importance of STEM education, a quick search will return valuable STEM resources in your state. You may be thinking that STEM is old news, high schools are full of STEM programs and science and math classes are being taught at all levels. The debate is not one for me to dig into here, but exposure to STEM and critical thinking skills are more important now than ever due to the vast amounts of information we have at our fingertips. Providing our students with opportunities and exposure to these skills will help with any path they will travel and should be a priority. If you are involved with a particular STEM related program or organization please share in the comment section. Thanks!